The 2019 Cheese Curd Festival, taking place June 21 and 22, is positioned to be our biggest and best yet, as we continue building the festival’s reputation as a true foodie and music event. We know you’re going to want to be a part of the excitement! Sponsorship opportunities are available at five levels, each designed to offer you the greatest visibility and exposure. 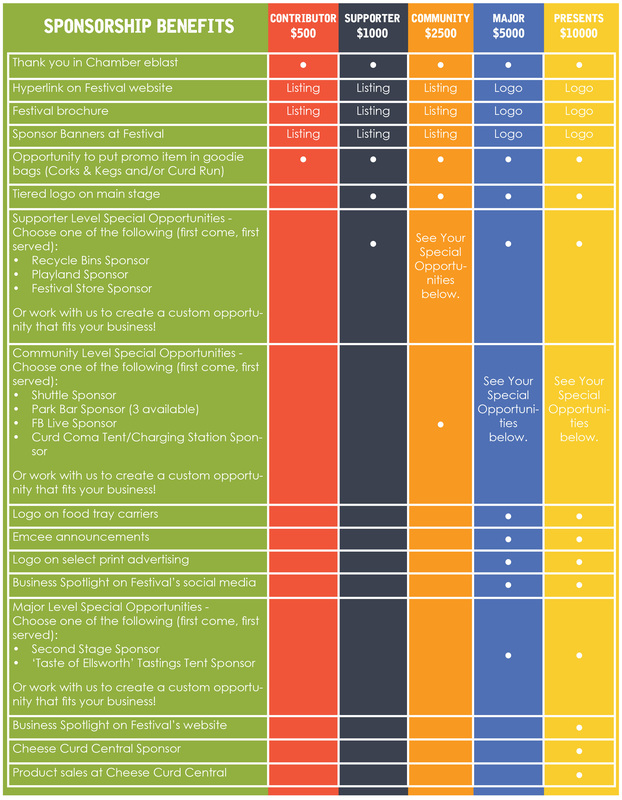 Depending on the level you choose, you have the opportunity to take advantage of valuable bonuses, which allows you to customize your sponsorship and get the greatest benefit for your business. Check which level of sponsorship you’d like sign up for, and if there is a ‘Special Opportunities’ section, please mark your first and second choices for sponsorship areas.